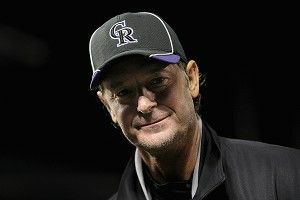 Jamie Moyer, 49 years young, just became the oldest dude in the history of old dudes to get a win in Major League Baseball. He threw 87 pitches in seven innings, allowing six hits and two runs (none of them earned) in a 5-3 Rockies win over San Diego. You can watch the highlights here, which are remarkable for the fact that they include a lot of double-play balls and other grounders, but only one strikeout. In fact, Moyer managed to break the 80-miles-per-hour barrier exactly zero times over the course of his historic start. That means his fastest fastball had less velocity than almost every other pitcher’s slowest changeup. well, now he’s the oldest guy to ever win a major league baseball game. So we shouldn’t expect a lot of punch-outs. We also shouldn’t expect him to leave an inning without giving up roughly 15 runs, but somehow he has the craftiness and guile to leave major league hitters waving at air. It’s counterintuitive and absurd, but he’s been old for a long time now, and it’s still happening. There are two ways to appreciate what Moyer is doing. The first is the young way, which is to see him as an interesting novelty, a quirk in the natural order of things, equal parts impressive and amusing. Nothing wrong with that. We were all young. The other is the old way, which is increasingly accessible to athletically oriented people approaching their 30th birthday (and, of course, beyond). I play in two softball leagues here in North Carolina, and let’s just say that things aren’t what they used to be. The overall skill is roughly the same, but the state of the body is not. If I take a lot of swings when we have batting practice, I know my back and chest will be sore the next day. I have this weird knee tweak that hobbles me when I sprint if I don’t stretch for a long time before the game. (I suffered the original injury, embarrassingly, playing Ping-Pong.) My right rotator cuff is screwed; when I play third or shortstop, I actually pray that any balls coming my way are hit really hard (preferably by a big, fat guy) so that I can take it easy on the throw. I’ll still unleash the hard ones when I have to, but I know I’ll pay for it. I’m 29. That’s 20 years younger than Jamie Moyer, who I now understand is the baddest mother on the planet. I grew up hearing my dad and other aging men complain about the aches and pains of getting old, but like every other cocky young person in the world, I didn’t take it to heart. Now I do, and I understand Moyer in a clearer light. He’s nothing less than a legend. I had to laugh at the audacity. But now here he is, back in the bigs. As Jim Caple pointed out in an excellent feature, he’s pitched in a record 49 major league ballparks, one for every year of his life. But the fact is, he’s not a great pitcher. He’s never won a Cy Young Award. He’s made just one All-Star game. He won his only World Series in 2008, with the Phillies, and he pitched well (6⅓ IP, 5 hits, 3 runs, 5 strikeouts) in a game the Phils eventually won. If he makes the Hall of Fame, it will be because of his longevity rather than his talent. Despite sitting 40th on the all-time innings pitched record list, he’ll likely never reach the dual milestones of 3,000 strikeouts or 300 wins. He’ll retire with an ERA comfortably above 4.00. But despite it all, the spotlight on Moyer has never been brighter. There’s a universal fascination with an athlete who succeeds at such an advanced age, and with each passing day, his legend grows.